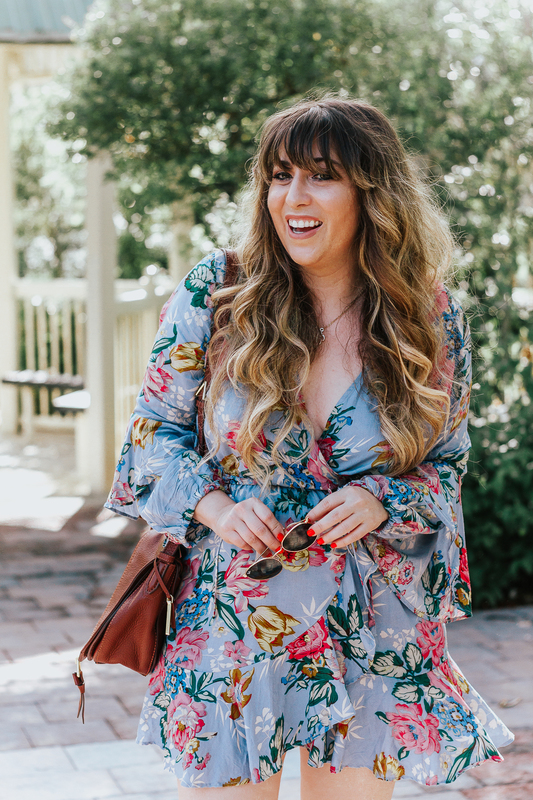 This bell sleeve romper pretty much has the characteristics of all the things I’m currently obsessed with: it’s a romper, off the shoulder, bell sleeved, striped, blue, ruffled… any one of those things would be a major selling point to me, so putting them all in one piece obviously makes it a must-have for me. I’ve worn it a few times now for different things. Most recently, I wore it to lunch last week with Kristin. We went to Brickell City Centre here in Miami to check out the Summer 2017 Kendra Scott collection and then had lunch at Tacology, the cutest little spot in Brickell for yummy guac. (The rock shrimp tostada was TO-DIE!!) We had such a fun time checking out the collection and there are sooo many good pieces in the collection. I basically wanted everything, which you may have noticed if you follow me on Instagram and checked my Story. After we shopped ’til we dropped, we had a delicious lunch and caught up a bit. My favorite thing about having blogger pals is that mid-day IG-worthy lunches are basically part of the job haha! The romper is a little on the stiffer side at first, but just throw it in the washing machine with fabric softener and it’ll be good to go. I also didn’t love the belt, it wasn’t long enough to tie in a bow! I had to tie it in a knot. Kinda weird, but it was ok. It’s only $19.99 and a great buy. It’s also available in white and black stripe. I’m wearing a large, for reference. Thanks so much for reading! I hope you’re having a great week! Today’s my sister’s birthday so we’re spending the day together and then going to dinner tonight. We’re going to Cheesecake Factory and I am PSYCHED!